Last week I wrote a blog post asking for suggestions for math to present to my son’s kindergarten class. My readers posted many great comments. Thank you all. Today was the big day,… and it was a great success! I began by talking about what I do. My son introduced me as a math teacher. I asked if anyone knew the “big name” for a math teacher. One of the other kids said mathematician, which impressed me (even though her mother is also a mathematician at my college). I told them that I had two main jobs: teaching math and doing research to try to discover new math that no one else had ever thought of before. We talked a little bit about what math is: numbers, patters, shapes, puzzles, etc. Then I told them I had two activities. This one I stole almost completely from this wonderful post at the Math With My Kids blog. You can read his blog for more details, but here it is in a nutshell. At home I wrote three sequences on piece of poster board and covered the numbers with Post-It notes (actually, you could see the numbers through the Post-Its, so I put decorative stars on them to obscure the view). Here’s the trick with the last one. Start with 1 and ask them what they see. One. How many ones? One. OK, you see one one—then I peel off the 1 1. Now what do you see? Three ones. I peel off 3 1. Now what do you see? Four ones and one three. 4 1 1 3. etc. It was tricky, but I really think that they got it (or some of them did). Taking MWMK’s suggestion I asked them, if they thought that there would eventually be a 5, or a 10, or 100, or 1000000, etc. I told them that I didn’t know and that maybe no one knew, but these are the kinds of questions that mathematicians ask. And it is their job to see if they can answer them. The kids seemed to love this activity. They were shouting out the next numbers at the top of their lungs. The teacher did a great job of occasionally bringing them back under control without squashing their enthusiasm. Then I passed out a marker and a strip of paper with 8 boxes in a row to each student (actually, my son passed them out—he loved being my assistant). I asked them to write down the first 8 terms in a sequence that had some pattern—they could make it any pattern they wanted. After they were done I took volunteers to share their sequences. It turned out that almost everyone wanted to show off their pattern. The circus is coming to town and the ringmaster accidentally left behind a trunk that had some of the circus equipment. He needs the following things in order for the circus to be able to run. Harnesses for the two trapeze artists. A giant collar for the fierce lion (in the original it was a belt for the fat lady). Collars for the two-headed dragon (in the story it was belts for the Siamese twins). A decorative belt for the dancing elephant (this wasn’t in the original story). I held up the picture below with the needy circus stars. Because his trunk was missing, all the ringmaster had at his disposal were three belts (made from strips of paper taped end-to-end: one with no twists, one with a half twist, and one with two half twists) and a small rectangular piece of fabric (an index card). 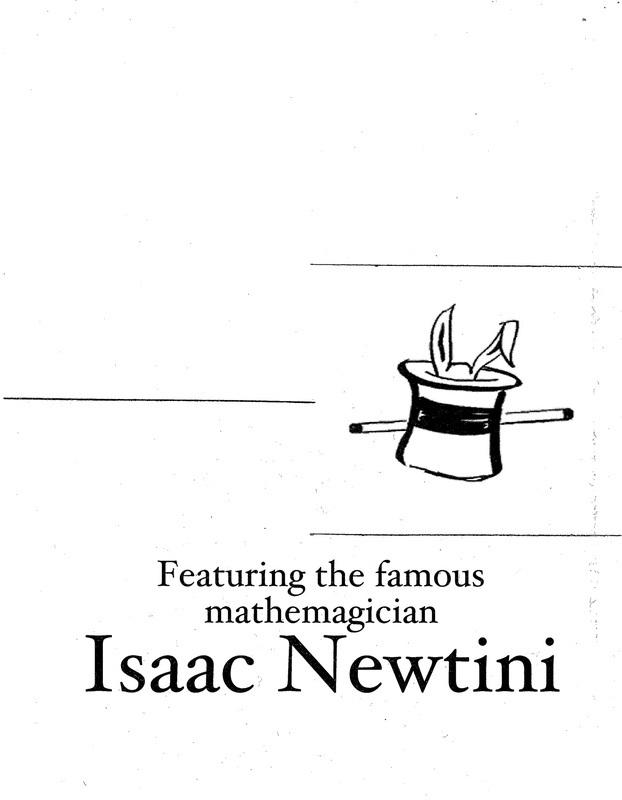 The ringmaster asked Isaac Newtini if he could turn these four objects into the objects he needed. The mathemagician said he could. I had made all three types of twisted bands the night before. They were made with long thin paper and had the midlines drawn on them to guide the kids’ cutting (to get the full effect, the Möbius bands had a line drawn down both sides of the strip before taping). I put a little cut in the midline so that the kids could insert their scissors and start their cutting easily. I put 1’s on the untwisted bands, 2’s on the Möbius bands (with one half-twist), and 3’s on the bands with two half twists. My son passed out pre-made versions of all three types of twisted bands to the class (one to each student) along with scissors. I asked the 1’s to hold up their hands. I asked them what they thought would happen when they cut down the middle. They all said that they would get two bands. They did the cutting, and found that they were correct. These were the harnesses for the two trapeze artists. Then I asked the 2’s what they thought would happen when they cut their bands down the midline. They gave the same answer as the 1’s did. (By the way, I told them that their object was called a Möbius band.) But when they cut down the midline they discovered that they still had one loop, now twice the length. (The gasp of shock that came out of many of their mouths—especially the teacher’s—was priceless.) This is the collar for the lion. When I asked the 3’s what they thought would happen, I got many different answers. When they did the cutting they found out that it produces two bands linked together—for the two-headed dragon. Finally, we came to the dancing elephant. I asked if they had any ideas how we could make a big decorative belt using only the index cards. One child suggested cutting it into thin strips and taping them together—a brilliant idea, I thought—but unfortunately, I told her, we used up all the tape making the bands. Instead, I used this trick to show them that you could turn an index card into a decorative belt for an elephant. I put the finished product around my son’s waist. I ended by giving them uncut versions of the Isaac Newtini poster and suggested that they try to cut them and fold them to look like the poster (I showed them why the poster was so weird). Overall this was a great experience. I could tell my son was extremely happy that I came in to talk to his class. The kids seemed to have fun. And, my son’s teacher loved the lessons. She asked me if I could come back another time this year to present another math activity. The whole presentation took about 35-40 minutes. Wow! You did so much! It sounds like fun! Thanks for telling us all the great details. I’m glad that you were able to use my idea with the number sequences and that the kids liked it so much. This sounds like an amazing presentation, and I am looking forward to one day stealing it and using it.